You can't turn on the TV these days or strike up a front-yard conversation with a neighbor without spending some time discussing the economy. The current state of our nation's finances is affecting us on every level—in our personal and business finances, and at church, also. In the midst of these tough times, I have been so proud of the way Accessibles have responded! You have continued to give generously, even when times are tough. In the midst of uncertainty, you have shown that you are certain of one thing: God owns it all. As a result, you have been open-handed and generous. Thank you! First: As of May 31, 2009, we have fallen only $4,022 short of our budget. And, thanks to the discipline of the staff, we're about $15,091 ahead of budget on the expense side. So, we're $11,069 ahead of budget (net). Woo-hoo! Second, there's more good news! Accessibles give about 80% of what's needed to currently sustain Access. The other 20% comes from people who love what you're doing and why you're doing it, but they don't attend Access. We call these people "Visionary Givers." Some live in Jacksonville, some don't. Together, those Visionary Givers have come alongside you and added $37,200 to your gifts to keep us in the black. Awesome! Third—it gets better. Each month, more and more people decide to join in and give back to God a priority percentage from what He's given them. As a result, we've almost doubled the number of singles and families that give to Access Church in just the past 9 months!! 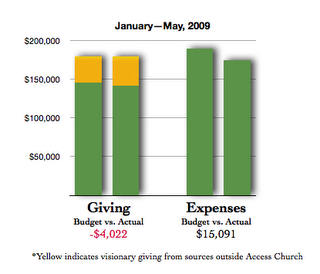 In March of 2007, Access was supported by just 8 families. Now, we average 81 singles and families that give each month. Thank you! Because of your gifts, we are able to accomplish our mission. If you'd like to jump on board, or know someone outside of Access who might like to become a Visionary Giver, you can click here to begin giving online.